Divorcing or separating from someone who you once thought you would spend your life with is never easy. We give up on our dreams, the happy ever after kind of dreams. If there are children involved, two normal healthy adults will seek to co-operate and co-parent and give their children a happy, loving childhood free from disharmony and bitter squabbles between their parents. I’m not sure that there is such a term as co-parenting when it comes to a split with a narcissistic partner. Some would call it counter parenting. Cooperation, compromise and teamwork are not part of the narcissist’s vocabulary, so don’t expect them to play fair. The narcissist is not going to put the needs of their children before their own. Their maternal or paternal instincts are not normal by any stretch of the imagination. If you walked away from a dysfunctional relationship with a narcissist, they will not want to lose you as a source of supply. They will not want to lose control over you and one way of maintaining that control is through your children. When children are involved in a break-up it is impossible to go ‘no contact’ with the narcissist and they know it! The presence of children will force you to keep contact with your ex for many years after the ink has dried on your divorce papers. It is difficult to understand but your narcissistic ex doesn’t love your children like you do. In fact, they may not love them at all. They may simply be seen as pawns to be manipulated, little people who can be used to hurt you. The narcissist may manipulate your children’s thoughts. They may lie to the children to turn them against you. When a narcissist experiences loss such as a divorce, they will experience a narcissistic injury or wound and will often react by making the other parent look bad. If they believe that you have wronged them, they will seek revenge by hurting you in the most painful manner possible, alienating you from your children. Children are easily influenced by this covert manipulation. We know that narcissists love to push you to your limits and create chaos in the lives of those around them. Just because you are no longer together, don’t expect this behaviour to stop. In fact, it may escalate. If they can rile you enough so that you react, they can prove just how unbalanced and crazy you are. So, for your own sake, keep calm, don’t react and never give them that pleasure. If you are trying to maintain a semblance of control over your independence, expect a counterattack from your ex-partner. They will not take kindly to your new-found freedom and may try every trick in the book to draw you back into their sphere of influence, such as switching on the charm, looking for your sympathy, threats or hostility. Since no contact is not an option, minimal communication is advised. Keep contact in writing by text or email where possible, keep it short and to the point. Firstly, this will give you time to think what you are going to say, and your words cannot be twisted when they are there in black and white. Secondly, it leaves a paper trail that may be used as evidence if necessary. Try not to discuss topics about anything other than your children and don’t give out any unnecessary information about yourself. If they go off on a rant, disengage and ignore them. Whatever is going on in your life now is absolutely none of their concern. It is important to set boundaries and stick to them. For example, when your ex is picking up your child, they have no reason to come in to your home. If there are set times for them to see the children, don’t let them chop and change arrangements for no valid reason. They may be doing so simply to annoy you, to make you change your plans or provoke a negative reaction from you. Remember that negative attention is still attention to the narcissist. Hard as it may be, try not to run your ex-partner down in front of your children. 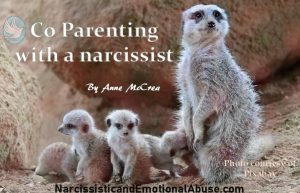 As they grow and become adults, they will form their own opinions about their narcissistic parent. Let them do that without any help from you. That way they can’t blame you for turning them against their other parent. Telling your child things about you, whether true or false, in the hope of turning the child against you. Refusing to pay child maintenance. Narcissists want the very best for themselves. Their children are secondary. The children’s needs will not be as important as their own. Making you feel guilty if you refuse them more time with your child. They will appear to be the ideal parent in public. Remember it’s all about appearances. I once heard a narcissist described as a street angel and a home devil. To be seen as the perfect parent is paramount. Once again, this is not about the child but how they look to others. Unfortunately, the behaviour of the narcissist is not likely to change. During this toxic union, you probably felt under their control and always tried to please. Remember that now you are no longer in the grasp of their clutches. You are your own boss. You have control of what you will accept and how you will react. You have the power to keep this person at a distance and not put up with their nonsense any longer. Keep communication to an absolute minimum. Keep strict boundaries and don’t let the narcissist cross them. Have faith in yourself, your strengths and your parenting skills. Ignore your ex’s threats and don’t rise to baiting. Focus on the needs of your children and show them how a loving parent behaves. Over time the narcissist will see that their behaviour is not getting the results they desire. They can no longer push your buttons. Without the attention they so crave, with any luck they will eventually seek their supply elsewhere.